Go Back To info Page. What is a braille display ? 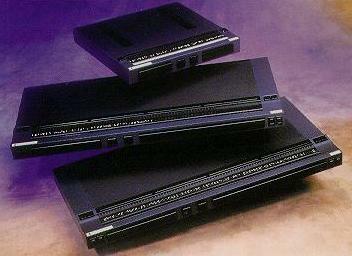 A braille display is a tactile device consisting of a row of special 'soft' cells. A soft cell has 6 or 8 pins made of metal or nylon; pins are controlled electronically to move up and down to display characters as they appear on the display of the source system - usually a computer or braille note taker. Soft braille cells have either 6 or 8 dot pins depending on the model. Advanced braille code features 8 dot braille, but most will probably only use the 6 dot code. Dots 7 and 8, if present. can be used to show the position of the cursor in the text or for European 8 dot braille. They can also be used for advanced maths work and for computer coding. A number of cells are placed next to each other to form a soft or refreshable braille line. As the little pins of each cell pop up and down they form a line of braille text that can be read by touch. For the technically minded the pins that rise up and down are either tiny solenoids or piezo-electric outputs. Some braille displays also have a router facility. A router button (or sensor) controls the position of the text cursorpress on the router button of a cell and the cursor moves directly over that letter in the text. 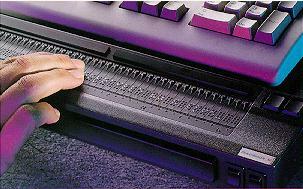 Soft braille cells are combined in a line to make up a braille display, The number of cells in a braille display has been designed to manufacturers to suit the text modes of computer screens. This is because an important application of braille displays is to provide access to computer text. Full size braille lines are 80 cells long - this matches the number of characters across the width of a typical word processor screen. Braille lines with less than 80 cells cope with an 80 character print line by displaying it in stages, e.g. a 20- cell line would display it in four stages. This is not ideal, but smaller displays are much cheaper than 80 cell lines, and so are a more affordable purchase for many users. All the Refreshable braille displays above, are called the Powerbrailles 40, 65, and the 80 cell Display and they all made by Blazie Engineering.